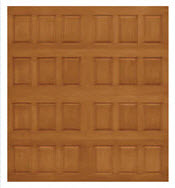 Garage door model 981 features a vertical raised panel design and an oak wood grain. Three-section styling on 7′ high and under doors provides a custom look. Doors over 7′ and up to 8′ high have four-section styling. All panels have finished white interiors with white low-profile hinges. 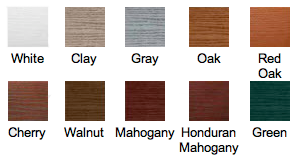 Available in ten colors, including Cherry, White, Mahogany, Walnut, Oak, Green, Gray, Clay, Honduran Mahogany, and Red Oak. Additional styling is available with window glass and decorative hardware options. Utilizes Therma-Tru® AccuGrain™ technology for the beauty of wood without the maintenance. Choose the glass, design and color to perfectly complement your home. Ensures proper alignment and smoother operation with a clean interior appearance. with an R-value of 7.6 helps control costly heat loss and gain. This type of insulation can diminish street noise and makes the door more quiet as it operates. Doors are available in ten standard colors. 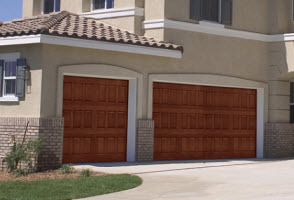 The Impression Collection™ doors have been magnificently engineered with an artfully molded wood-grain fiberglass surface concealing durable steel construction. These doors feature polyurethane insulation and an R-value of 7.6. *Clear insulated glass also available as an option. 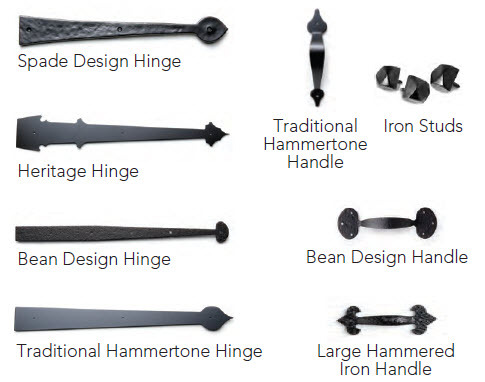 Choose from a variety of decorative handles and hinges to further individualize your garage door.